There is nothing unique to Britain in the use by hunters of Saluki cross sheepdogs as versatile hunting dogs, which use speed, scent and stamina to catch their quarry. In Iraq, the 'luqi' or Saluki crossed with a local sheepdog has long been used as a "thinking" sighthound. The quarry would be gazelle, fox or hare; the ground mostly rocky but very muddy in the rainy season and the 'going' extremely testing, especially to the feet. The 'luqi' is prized for its superior nose, in conditions where scenting is surprisingly difficult. Perhaps too this sheepdog blood made the 'luqi' more biddable, something many lurcher men here seek in their Saluki cross dogs. The Kurds produced the khilasi, a cross between their Saluqi and a Kurdish sheepdog, to improve scenting ability and response to training. In south Syria, the Arabs bred the zaghuri, allegedly from an outcross to a zeiger, Old High German for a pointer, said to have been introduced by the Crusaders, to enhance scenting power. I have known men famed for their skill at training hunting dogs of all kinds, regularly reduced to the hair-tearing stage when faced with an independently-minded Saluki. Is it perversity, wilfulness, lack of concentration, periodic deafness or just straightforward stubbornness which makes this breed so trying? My abiding memory of hare-coursing in Jordan is of the need for a jeep with a well-filled tank and powerful binoculars, not to find the game, but to recover the hounds! But for the patient, the stoical and the long-suffering, the rewards, in the end, of seeing a once-exasperating Saluki mature into a good reliable hunting dog are manifold. (Perhaps understood best, in different fields, by Basset Hound and Clumber Spaniel owners!) But what a sight a Saluki is - at full stretch ; they seem to fly across ground which a human being couldn't jog over. The advice I received from the bedouin about the criteria for a sighthound to run fast for extended periods over difficult terrain boils down to just two points: girth of chest and girth of loin. Heart and lung room and power of propulsion would be another way of putting it. The users of gazelle hounds in the desert looked for, in say a 26" hound, a girth of chest of 26 to 31" and a girth of loin from 18 to 24 inches. The bedouin don't bother with breed descriptions Kennel Club-style, with flowery accounts of anatomical beauty. From al-Mutawakkili, writing in the ninth century, we can however learn that a long body with a short back, powerful loins, deep chests, fleshy shoulders and powerful flanks were valued by the hunters of those times. Lurcher men were slow to appreciate the value of Saluki blood for some years. Even now however show-bred Salukis with shelly bodies and few hunting instincts are being utilised by lurcher breeders in the forlorn hope that some good Saluki features will be inherited in their breeding programmes. I'm surprised that some enterprising soul hasn't imported real hunting Salukis from the middle east, hounds with a known field performance. Lurcher men would be the first to admit however that the Salukis deployed to the field by the admirable Saluki Coursing Club are fine hounds. "Amena Viceroy of Anasazi" won the Scottish 32 dog, three day stake three years in succession, the only hound to achieve this in the thirty years of the event. Salukis like this deserve all the praise we can muster. But for those who seek pedigree status and need registration for their imported stock, the Kennel Club has not been particularly cooperative. Sir Terence Clark KBE CMG CVO, once our ambassador in Oman and a keen coursing man, who knows and appreciates hunting Salukis, has raised this issue with the KC. 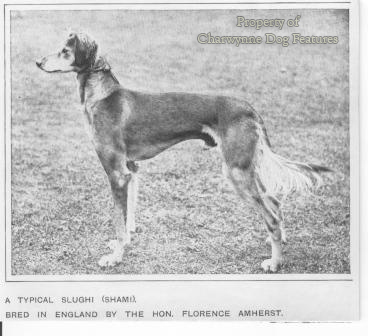 Not a show-ring fancier, Sir Terence was anxious that Saluki breeders here should benefit from the fine hunting stock, often crop-eared and lacking the breed points of the KC pedigree Saluki, available in countries like Iraq. But they could not be registered by those who would wish to do so. Incidentally in replying to Sir Terence's letter, the then secretary of the Kennel Club, General Sinnatt, wrote: "...it would be difficult to believe that breeding patterns within desert tribes would be as strictly controlled as those under the aegis of the Kennel Club". This, despite the fact that every Saluki in Britain originated from the "breeding patterns within desert tribes" so patronisingly referred to by the chief executive of the KC. How can real sporting men take such an organisation seriously? Can the lofty KC pedestal be justified? The Saluki judge at Crufts 2007 recorded: "I wondered where the breed is heading...Hindquarters were a particular worry with lack of length and substance to upper thighs." The KC tells us that these are 'the best of the very best': what must the non-qualifiers be like! At the Saluki or Gazelle Club show of 2006, the judge reported: "I was shocked at how poorly many dogs move." At two other shows that year comments ranged from a lack of quality in depth and lack of forward reach to plaiting and close movement behind. The Arabs could send some improving blood, if only our KC would let them! There is no single type of Saluki. Most of the hounds I've seen in middle eastern countries have been smooth-haired (the Nejdi type), not feathered (the Shami or Syrian type). The smooth coat is dominant. 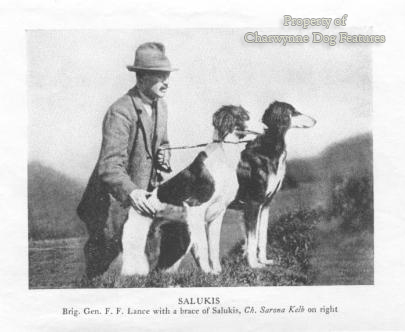 In the pedigree world we have smooth and feathered hounds registered as Salukis, with the smooth-coated Sloughi (from No rth Africa) listed as a separate breed. The Arabs there however referred to them as mogrebi or western. The Tuareg Sloughi, sometimes known as the 'oska', is classified separately in some countries as the Azawakh Sloughi, from the valley of that name in Mali and Niger. Both the Azawakh and the Sloughi have been found to possess an additional allele on the glucose-phosphate-isomerase gene locus, not found in other sighthounds but also featuring in the jackal, suggesting a separate origin. Circassia, in the Caucasus, was once famous for its sighthounds; but Circassians can be found in Syria, Iraq, Jordan and Turkey too. 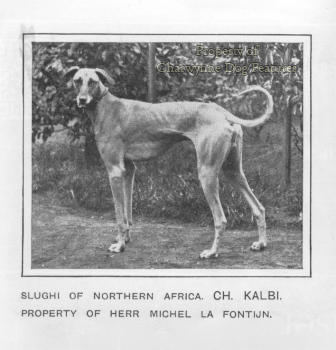 The Shilluk greyhound from the plains of the White Nile in Southern Sudan is more Saluki-like than Greyhound-like. The Poligar and the Vaghari of India too have a distinct smooth Saluki look to them. The famed areas for the best Salukis as hunting dogs have long been the Wadi Sirhan in Syria and Rutba on the Jordan/Iraq border. The Saluki type manifests itself from west Africa, through north Africa and what was Mesopotamia, to the Iran/Afghanistan border. Some are used to track game; others to slow game down for the hawk and others to catch desert partridges before they can take off. If anything they are the lurchers of the desert, versatile hunting dogs not just fast runners. They may present a challenge to the impatient but, from their distinguished heritage, have genes worth having. For a while however, their handlers may still have need of a well-fuelled jeep and a good pair of binoculars !